Given that beans are such a regular part of a slow carb diet and slow carb recipes, I thought that it might be a good idea to take a look at what exactly makes them so healthy. On that note, this post is all about kidney beans nutrition facts, and why you should incorporate them into your diet. I'm sure that anyone who has been following the slow carb diet (made popular by Tim Ferriss in his book "The 4 Hour Body") knows how frequently their meals include some kind of beans or legumes. Luckily, there are several different varieties to choose from, so it doesn't always have to be the exact same meal every single day. Undoubtedly, though, you will be find favorite recipes as you progress through the diet. One of my favorite ingredients that seems to be a staple for many of the meals I consume are kidney beans (so it's a good thing I like them!). Kidney beans are actually the seeds of a bean plant, with the Latin name Phaseolus vulgaris. The beans themselves grow in the large green pods like those that inhabit so many people's home gardens. Think about green beans or string beans, but much fatter pods. The beans themselves are typically dark red or reddish brown, though you can also readily find white kidney beans (or, simply, white beans). These common beans are used around the world, both dried or canned, in a wide range of both hot and cold recipes. They are truly versatile! In that 1 cup serving of kidney beans, there is a total carbohydrate amount of 56 g, of which only 8 g are sugars, but 19.5 g are dietary fiber. This is one of the biggest reasons why beans are so good for you: their high fiber content! In addition, another great testament to the nutrition of these beans is their low fat content, with only 1.2 g of total fat (of which 0.1 g is saturated). In terms of protein, our bean serving has 22.2 g, which is also pretty decent. Of course, whenever people look at the nutrition facts and labels, they are not just interested in those three classes of molecules or the calories. One of the other big numbers is the cholesterol. Obviously, the cholesterol value is very important to people who have cardiovascular health problems such as hypertension or atherosclerosis, as they would want to minimize the amount of cholesterol in their diets. Luckily for them, the kidney bean's nutrition label shows that it is like a super food, with 0 (zero!) cholesterol! Also on the topic of cholesterol, I will also point out the value of having high dietary fiber, which as I showed above, these beans certainly do. Fiber actually works to lower the "bad" cholesterol that is already in your body. (I'm not getting into a discussion of "good" vs. "bad" cholesterols. Maybe another time!) So, you can see why including kidney beans in a slow carb diet, or any weight loss plan, is absolutely essential to helping lower fat and cholesterol. The point is that kidney beans contain a wide assortment of these vitamins and minerals that are needed by your body for it to work properly. Kidney beans are used by several cultures around the world. They are very popular, and very common. They can be dried for prolonged storage, and then simply rehydrated when it's time to use them, or they can be purchased canned and ready to eat. With the multitude and diversity of recipes available that include kidney beans (I have lots on my site! 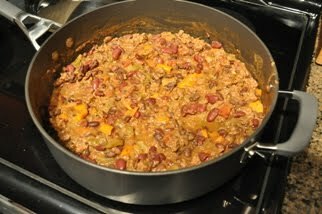 Check out my traditional chili recipe or my turkey chili recipe! ), there really is no excuse to not include these in your slow carb diet plans! I hope that you learned something from this post and you can now better appreciate one of the slow carb "super" foods. Please remember to +1 me if you enjoyed it (top right of the page)! Kidney beans are really effective. Then I will have a try on it. Very informative post, thanks to share..Kidney beans are rich in vitamins and helpful to keep us healthy..